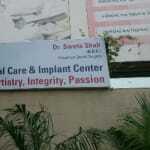 Dr. Sweta Shah is a popular Dentist in Vadaj, Ahmedabad. She is currently practising at DEVASAYA DENTAL CARE in Vadaj, Ahmedabad. Book an appointment online with Dr. Sweta Shah and consult privately on Lybrate.com. Lybrate.com has a number of highly qualified Dentists in India. You will find Dentists with more than 33 years of experience on Lybrate.com. Find the best Dentists online in Ahmedabad. View the profile of medical specialists and their reviews from other patients to make an informed decision. It was amazing. She is a brilliant doctor with lots of talent. She was very careful and gave very right suggestions. I am suffering from bad breath ,all the time there is fowl smell comes from my mouth ,its been one year, I consult with many dentist some said its brushing problem ,some just cleaned the teeth ,i have tried everything but it doesn't work. I don't know whether its coming from stomach or mouth but it persist all day. I am very depressed about it. Please help me. Bad breath can be due to many reasons. Tooth cleaning can be just part of treatment. U can go for thorough check up. And solve it. Due to dry mouth less water intake or other reasons. I am suffering from mouth ulcers. After medication it will be cured, but after some time it will again come. I have no constipation but I have low hemoglobin is that the reason or something else. Please advise. Mouth ulcer can be due to many reasons. It can be due to stress or vitamin deficiency. So kindly go to dentist have it ruled out. I am suffering from tooth decay my most of lower teeth left to right Conner except middle are decay. What should I do and how much it will cost? You can go to any dentist. Decay will cost you filling or cap. It will cost you around 2000 per tooth. Cap will cost you more. I want to go for gum surgery. Which is the best for me. Laser or normal flap surgery. Please suggest me. What is the expense of both. Flap surgery. Manual around 15000 to 18000. And laser around 22000 to 25000. Prefer laser as it is painless bloodless. Hi mam, I am 23 years old. Can I reduce my tooth height with out braces ?and how much time taken with these process. You can reduce your tooth height without braces with cap. It takes approx 1 week. Though not advisable much. Go for braces if possible. Mera tooth Pura discolor ho gaya hai me crown lagwana chahata hu to 15 teeth me crown lagwana chahata hu cost kitna Padega. You should visit to Dentist and he will decide how many crown you required. Generally 15 crown cost you around 30000 or more. Most amazing thing in dentistry. Tooth implant. Those patients who don't have teeth and does not want to wear dentures. They should go for tooth implant. But it has to be a good quality implants. We can put 1 teeth with implants or multiple teeth also. That is for life time. Dental implants are good for oral health as well as bone health. My baby is 3 years old and her upper teeth has damaged and broken. Dentist suggests to do root canal. Is it right for my baby? please suggests. Yes you should go for Rct in this teeth. And maintain it till it goes on its own. Good suggestion from dentist. Hi. I recently changed my dentist for some reason. My new dentist after drilling cavities uses tissue paper to dry and clean inside of teeth. What will happen if some tissue paper is left inside the teeth while filling. Although I know he is a professional but none of the other dentists used to do this. Can you please tell me what will happen if some tissue paper is left inside teeth while filling. Thank you. Nothing will happen. Tissue paper do not harm or do anything. Just that it shouldn't left behind in cavity. I just did a root canal treatment for my front tooth couple days ago, and now having a bump on the gum. Not really painful but a bit swelling. What is it? Is that normal? Will that disappear within a couple of days? It is not normal. May be root canal is failure. .and you have pus in teeth which you can see as a bump on gums. Kindly go to dentist and have xray done.